National Cherry Blossom Festival in D.C.
You are here: Home / Destinations / Washington D.C. / National Cherry Blossom Festival in D.C. This year marks the 100th anniversary of the gift of trees from Tokyo to Washington, D.C. 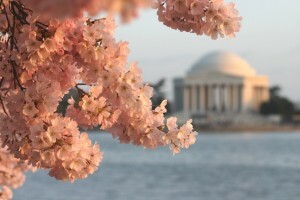 The National Cherry Blossom Festival is underway in the nation’s capitol. Events began a couple of days ago and run for five weeks until April 27th. Two other events that are signatures of the festival (and ones you should make an effort to check out) include the famed National Cherry Blossom Festival Parade and the Sakura-Matsuri Japanese Street Festival, which both take place on April 14th. Art and cultural exhibits, as well as musical performances will run throughout the five weeks, providing an informative peak into different aspects of Japanese culture, whilst promoting community spirit. Photos courtesy of National Cherry Blossom Festival.org. This sounds like so much fun. Hopefully, next year I can make a trip. Yes! You have to reserve you’re calendar around this time of year. How come you do not have your website viewable in wap format? cant view anything in my iPad.